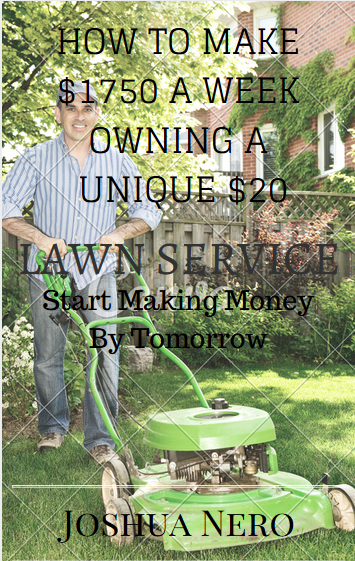 HOW TO MAKE $1750 A WEEK OWNING A UNIQUE $20 LAWN SERVICE!! Start Making Money By Tomorrow!! This is a fast cash generator,you will have money rolling in by tomorrow! There is technically no competition at all at this enormous business! LEARN the secrets on how to get numerous customers for the business overnight. This business is very easy and anyone can do this. There are literally a million potential customers waiting on you. EVERYONE HAS GRASS,WHY NOT PROFIT FROM IT!! Bonus 1# Flyer- You get a flyer that you can have unlimited use of,just edit the information and it's ready to use. No need to sit around and design one. Bonus 2# Extra Money Making Ideas- Also included are other ideas that will help increase profit and also receive customers. Bonus #3 Contracts- I have included sample contracts,classified ads, receipts,employment applications,customer referral letters,sample estimate letters,and sample expense logs. P.S. Everyone will benefit from this business.